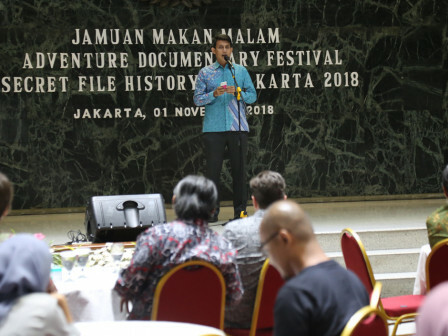 Jakarta Government holds a banquet at City Hall to welcome participants of Adventure Documentary Festival 2018 "Secret File History of Jakarta".
" It needs modern approach"
Adventure Documentary Festival Academy (ADFA) Coach, Nicolaus Lumanauw, some history enthusiasts and academics also attend on this event. Jakarta Disparbud's Information and Development Division Head, Alberto Ali expects this event to be a strategic momentum to create a synergy and partnership between Jakarta Government and participants regarding information of past history in Jakarta. "We are welcoming this festival. Together we can make it a continuous work," he expressed, Thursday (11/1) night. According to him, involving academics and students will make Adventure Documentary Festival 2018 becomes a special event. "History will not stop until the end of this world. It will become the priceless treasure," he said. He mentioned, one of children or students weaknesses is their lack of interest in history. Thus it needs innovative and creative ways to make young generations interested in history. "It needs modern approach. We have a much broader interest in introducing Jakarta's history using digital technology," he stated. He believes Jakarta's history has a potential to attract visitors if it is explained in communicative and attractive way and also using modern visualization. "We want organizers to develop more similar festivals or competitions, especially that involves students," he added. He conveyed, exploring Jakarta's history that haven't been revealed can be programmed attractively. For example is by presenting short films in series and uploading it in social media such as YouTube, Instagram, and Facebook. "Those documentations will make communities, especially young generations, become interested to study about Jakarta's history," he said. For information, Adventure Documentary Festival 2018 "Secret File History of Jakarta" is held on November 1-8. This event includes workshops, documentary adventures to Onrust Island, Taman Prasasti, and Kota Tua. Then, roadshow to campuses, and the Secret File History of Jakarta exhibition at the National Library of Indonesia.